A Thing for Roses: Friday Finds-Yee Haw! No school for the kids today so while they were snoozing away, I decided to venture out and hit a couple sales. So glad I did. My friend Bobbie, who used to be an antiques dealer and still does some occasional thrifting, called me last night to tell me that she was having a sale today. I asked if I could come early and I'm so glad I did. I found several cute things even though there were a couple dealers already buying stuff by the time I got there. My next stop was at the Friends Community Church rummage sale which is always hit or miss. 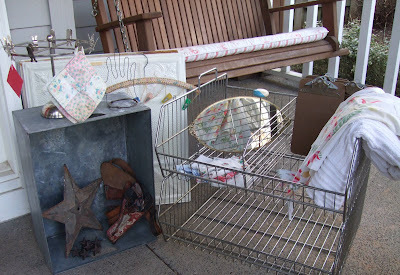 Today was a hit as I scored a few cute vintage items for next to nothing. Here is the group photo of my Friday Finds. Metal and cowboy were two themes today. I got the metal rack, funny metal hand, box, rotating rack, cast iron star and drawer pulls, and tin ceiling panels all at Bobbie's sale. I also got a cool old toy gun and holster and another holster, brass mirror with cherubs, and cute hanger with clips there. At the church sale I got several vintage hankies, a vintage baby chenille spread, vintage apron, quilted pot holders, mini clip boards and cool vintage hat rack. 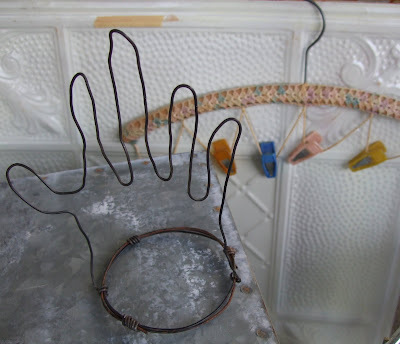 Close up of funky wire hand thingy and hanger. Close up of cowboy stuff. This will all be great to take to farm chicks. 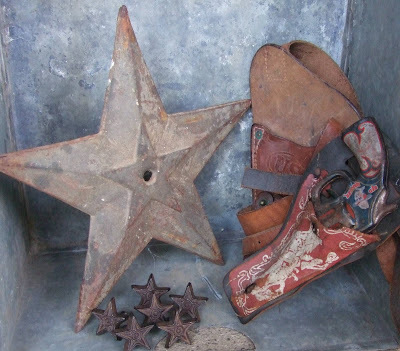 See what my buddy Suzanne Duda did with a cute old holster here. I think I just may have to steal that idea as it's so darn adorable. Have a very fun Friday, and in case you are wondering, I did stay home and clean yesterday. I love the metal rack...great stuff, I cannot wait for sales to start here! Now what Friends community church was that? I am a Friend and didn't know about it, hummm? Cool metal rack! The ceiling tiles are cool too! See you at the Farm Chicks!!! Good finds Lisa...I didn't even venture out to any sales today. You made up for me. Great stuff for Farm Chicks - it will be here before we know it! I do like seeing people's finds online. I find it so interesting! Great finds. Look at all your fun stuff! Hey I would love to meet half way one day. Let's do it!! All of the vintage cowboy stuff is fabulous! What great finds! Oh, what fun things you can do with these! Great finds!! It is still a bit early for sales to start in MN!